So week 1 of testing has passed, and all I can say is that there are no implications as to how this year’s grid will line up in Melbourne in a little over a month’s time! Here is a brief summary of what went down on each day of an interesting, but not very insightful, first week of testing. Day 1 saw all the teams doing basic tests to check if everything was in running order. System checks and basic tweaks can be quite time consuming for all teams, and ideally they want to get these things out of the way as quickly as possible so they can start putting mileage on their new machines. However, things did not get off to a flying start for Marussia and particularly Mercedes, their cars suffering from a rear suspension failure and a wiring loom fault respectively. Marussia’s issue was probably more serious, in a sense that something had structurally been at fault to cause that kind of failure, and I did not expect to see them run again this week (like Lotus last year with their front suspension mounts on the chassis). But I was proven wrong, and they were back out again the next day. As for the electrical issues that Mercedes had encountered, to me that wasn’t a huge problem, but it did cost them vital mileage and data, as they only completed 14 laps when ideally they were looking at 60+ for day 1. Of course, everyone stepping out of the car at the end of the day was all smiles and very positive, which is the standard at testing. Afterall, if the car is bad, the last thing they want to do is get the media on their backs and pile the pressure on themselves. But I genuinely got the feeling that everyone was satisfied with where they were at, or where they expected to be in terms of reliability and baseline performance. Although times are completely irrelevant, it is worth noting that Jenson Button set a 1:18.861 on hard tyres which, on a track with not much rubber down at that point, is quite impressive. Although, considering he missed most of the morning due to yet another fuel pump issue for the McLaren team, he might have wanted to get a feel for the car’s balance by running a bit lighter on fuel as he hadn’t done much mileage (only 37 laps completed) for his first day in the car. This day saw the continuity of baseline testing and starting to gather important data for the team to develop the car. To give you an idea of what these are, the baseline tests are car fundamentals such as what the driver thinks of the balance of the car and if all the systems are operating to his requirements. Data gathering is happening all of the time on modern Formula 1 cars, with millions of bits of data being collected every second from sensors across the car. However, teams will likely attach rakes and other contraptions to try and gather more data as to how the airflow is behaving over the car at different points. Here we can see a sensor attached to the right of the rear diffuser on the McLaren. It is also worth noting just how badly the Jerez track surface grains the tyres, we can see this in just this image alone. This is why teams are considering not testing here at all, as it does not give anyone any idea how the current tyres are working nor how long they last for. This is particularly important for this season, as Pirelli have introduced a softer tyre in compound and a totally different type of construction for 2013, the idea being that they will have a wider operating window and that they will produce more exciting racing by having increased degradation over last year’s tyre. Teams will also run flo-viz paint/dye to see how the airflow over the car is behaving visually. During 2009 testing, the media were up in arms when McLaren started using flo-viz on their car as it was traditionally the sign of fundamental aerodynamic issues, as indeed was the case with that particular car. However since then teams have openly continued to use it regardless of their performance, as it allows engineers to really understand what the airflow is doing over the car and if it corresponds with their findings back at the factory. Here we can see the Red Bull RB9 plastered with flo-viz across the rear of the car. Day 2 saw yet more problems for Mercedes, as a hydraulic line leak caused the rear-left brake to falter and the rear-right to fail completely, sending Lewis Hamilton straight on into the barrier at the Dry Sack hairpin. At this point the team really would have been concerned, as Hamilton had only achieved 15 laps before the failure occurred, when everyone else was looking at going 80+ that day. Grosjean topped the times on soft tyres, producing a 1:18.218. It was Ferrari’s turn to lead the standings at the end of day 3, as Felipe Massa lapped the circuit in the fastest time of the week, 1:17.879. To me I think this was done on fairly light fuel, as although I was not at the trackside to watch the car’s reports suggest that the Ferrari (under Felipe’s hands) was a fast but a bit of a handful at times. Don’t read too much into this, as one reporter made the point that Massa looked as if he was driving “back in his Sauber days”, referring to his slightly erratic style when he first entered Formula 1. Assuming this is the case, the Ferrari may well be on “a different planet” of performance relative to last year’s car, that Felipe describes it as but we won’t know until Melbourne. Some serious mileage was being done on this day, as Vettel, Gutierrez and Rosberg all clocked over 100 laps (Rosberg totalling a remarkable 148 laps, salvaging something from the teams’ previous woes). It was on this day that Caterham were at the centre of the first technical row of the year, regarding a flow conditioner to the exhaust. In the images below, an aerofoil shaped piece spans across the exhaust channel that teams use to direct airflow into the floor area using the coanda theorum, which capitalizes on airflow following a nearby surface. Lotus technical director, James Allison, pointed out that Caterham have added this aerofoil to further amplify this effect, as it directs airflow downwards more effectively. Allison argued that it was within the conical region around the exhausts that prohibit the use of bodywork to direct the gases to any benefit, as this is against the regulations. 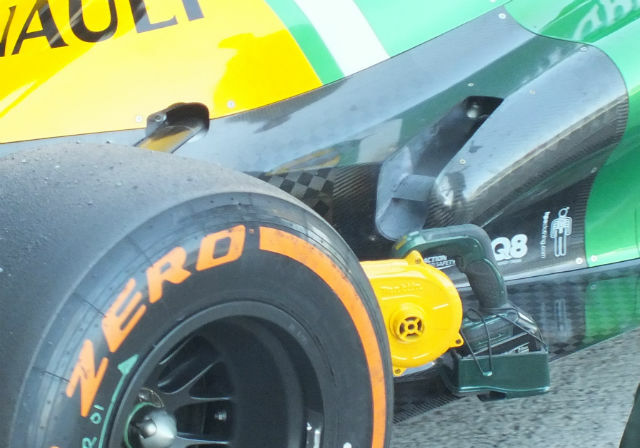 Since this had been pointed out, Caterham have removed it during running on the last day. Coincidence? Perhaps, but it would be interesting to know if that one flow conditioner on each exhaust gave them a significant performance benefit. Although the field will probably be so tight this season that any gain is worth having on the car no matter how much it brings in terms of performance. Finally, James Rossiter, testing for Force India that day, managed to cause minor injury to one of his mechanics in the pitlane in what I presume was a practice stop. This also managed to damage the nose of the car, ouch! The final day of testing ensured the Lotus finished on top, albeit not the fastest time overall. To me, the Lotus car has taken another step forward. This opinion has not been stemmed from its times, but from the knowledge that trackside reporters have pointed out and the general vibe that the team give out – from the drivers and the senior engineers/staff. I think they are very satisfied with how the car is and that more developments will really put them in the mix for the championship hunt. I felt very sorry for Pedro de la Rosa’s first run at Ferrari as test driver, as he had only done a handful of laps before a gearbox failure triggered a fire at the rear of the car, curtailing his running until fairly late in the day. I believe his expertise and experience will prove very beneficial to the team, as their primary aim is to get their simulator up to scratch. Pedro described the McLaren simulator as being quite a few years ahead of the Ferrari model, so his input should be vital to Ferrari’s future Formula 1 cars. Jules Bianchi was given a run in the Force India VJM06 as the Silverstone based squad continue to decide over their second driver. To me it is very late in the year to be still contemplating this matter but I believe Jules should get the drive. Every time he steps into the car he impresses with raw speed and he is also known to provide excellent feedback about the car, as he has tested for Force India (and Ferrari) many times. As he is a Ferrari Academy driver, he would provide a handy partnership to the Italian team if Force India choose to switch to Ferrari engines from next year. To me it’s a no-brainer, but there will be other things (i.e. financial backing…) to take into account. I haven’t mentioned Red Bull for the simple reason that they have been quietly plugging away with their test program throughout the entire week. They have put a lot of mileage on the RB9, the team are confident in its reliability and the driver’s believe it is another step. I highly doubt we will see most of the parts on the RB9 from this week in Melbourne, as there are too many similarities to the RB8 of last year. Expect a few things at the next test in Barcelona. Finally, Lotus and Mercedes were both testing their DRD devices. Hamilton was running what looked like a Lotus-style system, and Kimi Raikkonen was using a look-a-like Mercedes system! It was interesting to see how they had adopted eachother’s designs to try and find a way of accelerating the huge potential this device has. I will do a proper analysis of this at a later date. This entry was posted in 2013, Testing on February 9, 2013 by thewptformula. It’s a shame that testing isn’t as much use as it was for observers trying to guess the pecking order. Back when we had refuelling the tanks were smaller and the tyres lasted forever and a day, so it was easier to spot when someone had a critical advantage (such as Brawn).